We Mean Business > d i v e r s i t y w o m a n . c o m Fa l l 2 0 1 7 D I V E R S I T Y W O M A N 41 e program is widely used. In 2016, Connected Recognition recorded 230,472 "Recognition Moments" worldwide, with 19 percent of the awards shared by em- ployees in different countries. "We realized that internal public rec- ognition was really important to millen- nials," Singh says. "e program makes them feel like they are in a work envi- ronment that supports them and their growth, and that they work in the right place." Perhaps other generations are already responding to the millennials' lead on this. ere's growing data to show that all workers, not only millennials, value rec- ognition programs. A 2016 Gallup study found that only one in three American workers "strongly agreed" that they re- ceived praise for doing good work over the past seven days. Employees who don't feel adequately recognized are twice as likely to report wanting to quit in the next year. Do only millennials know best? 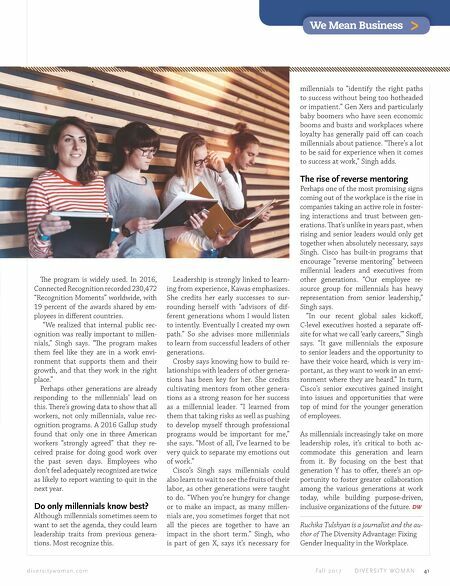 Although millennials sometimes seem to want to set the agenda, they could learn leadership traits from previous genera- tions. Most recognize this. Leadership is strongly linked to learn- ing from experience, Kawas emphasizes. She credits her early successes to sur- rounding herself with "advisors of dif- ferent generations whom I would listen to intently. Eventually I created my own path." So she advises more millennials to learn from successful leaders of other generations. Crosby says knowing how to build re- lationships with leaders of other genera- tions has been key for her. She credits cultivating mentors from other genera- tions as a strong reason for her success as a millennial leader. "I learned from them that taking risks as well as pushing to develop myself through professional programs would be important for me," she says. "Most of all, I've learned to be very quick to separate my emotions out of work." Cisco's Singh says millennials could also learn to wait to see the fruits of their labor, as other generations were taught to do. "When you're hungry for change or to make an impact, as many millen- nials are, you sometimes forget that not all the pieces are together to have an impact in the short term." Singh, who is part of gen X, says it's necessary for millennials to "identify the right paths to success without being too hotheaded or impatient." Gen Xers and particularly baby boomers who have seen economic booms and busts and workplaces where loyalty has generally paid off can coach millennials about patience. "ere's a lot to be said for experience when it comes to success at work," Singh adds. The rise of reverse mentoring Perhaps one of the most promising signs coming out of the workplace is the rise in companies taking an active role in foster- ing interactions and trust between gen- erations. at's unlike in years past, when rising and senior leaders would only get together when absolutely necessary, says Singh. Cisco has built-in programs that encourage "reverse mentoring" between millennial leaders and executives from other generations. "Our employee re- source group for millennials has heavy representation from senior leadership," Singh says. "In our recent global sales kickoff, C-level executives hosted a separate off- site for what we call 'early careers,'" Singh says. 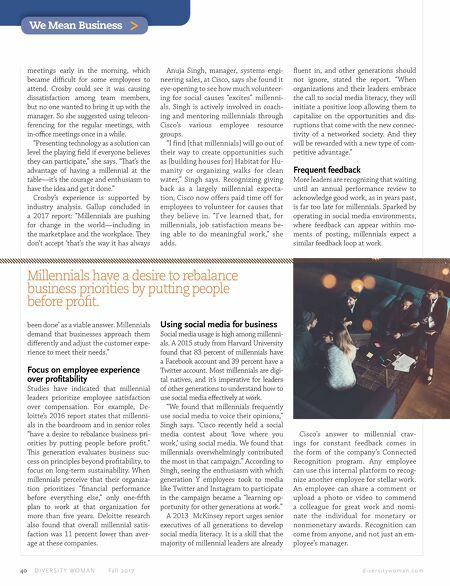 "It gave millennials the exposure to senior leaders and the opportunity to have their voice heard, which is very im- portant, as they want to work in an envi- ronment where they are heard." In turn, Cisco's senior executives gained insight into issues and opportunities that were top of mind for the younger generation of employees. As millennials increasingly take on more leadership roles, it's critical to both ac- commodate this generation and learn from it. By focusing on the best that generation Y has to offer, there's an op- portunity to foster greater collaboration among the various generations at work today, while building purpose-driven, inclusive organizations of the future. DW Ruchika Tulshyan is a journalist and the au- thor of The Diversity Advantage: Fixing Gender Inequality in the Workplace.